With the boom in free streaming-music services, it’s easier than ever to share what you’re listening to and sample from your friends’ playlists. But just because you can share music doesn’t mean you will. Just ask Apple, which is set to shutter its music social network Ping on September 30. But where Ping failed, others march bravely forward. Check out these ways to share and find new music. Odds are, you already have a social network, whether that’s Facebook, Twitter, Google+, or some combination thereof. That’s the best place to start being social with your music. Begin by following your favorite artists. This is an easy way to connect with friends who like the same music. On Facebook, the artists you like appear in your profile; and when you visit an artist’s page, you see other friends who like the same artist. Also, many artists use their connections to help promote artists they like, many of whom you may not have heard of before. 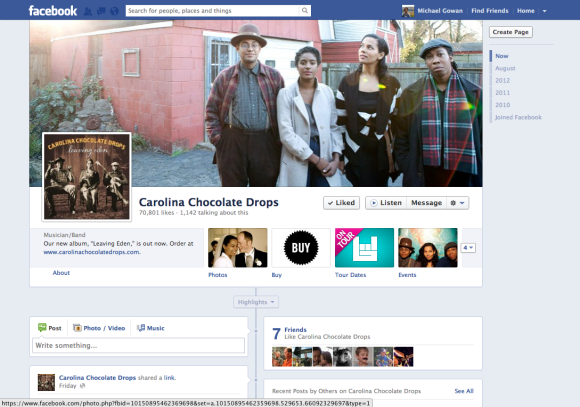 Artists like the Carolina Chocolate Drops use their Facebook page to promote shows and tell fans about other artists they like. Your friends and followers constitute a ready-made network, though not all of your friends may want to hear all your musical thoughts—and vice versa. I use Facebook’s list feature to create a custom list that contains only friends who generally post about music. This allows me to send posts only to these people; also, I can quickly filter posts from these friends when I’m focused on music. Facebook pages for radio stations offer another great social opportunity. These pages bring together people who may not be friends under the umbrella of a common musical genre. If you find a vibrant community, it’s a great place to ask questions like, “What was that song I heard at 1:30 today?” I follow the Facebook group for SiriusXM’s The Loft and find that the discussions on the pages—usually started by fans—often lead me to music I haven’t heard before, or haven’t thought about in a while. Almost all the streaming services I’ve seen feature buttons that let you post a link to the song you’re currently listening to on your Facebook page or Twitter feed, along with some space for a comment. But recommendations that you push like this tend to get in all the other insights in your feed. If you’re more serious about your music sharing, check out services that go beyond the basics to create a separate music social network. Streaming music services like Spotify, Rhapsody and Pandora let you create profile pages where friends can see your favorite bands and what you’ve been listening to within the service. You can also share stations you’ve created on Pandora, or share playlists you’ve created on services like Spotify. That’s the real benefit of social features within a service that streams music—if you’re looking for something new to listen to, just steal your friends’ tastes. 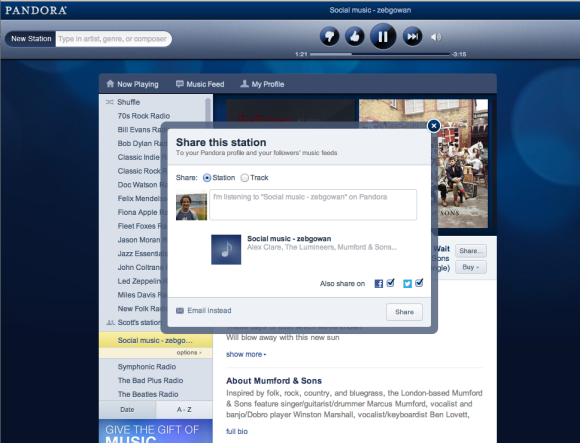 With Pandora, you can share a station you’ve created with friends through Facebook, Twitter, or email. On Spotify, Pandora, and Rdio, you can follow friends to see what they’ve listened to and then listen to it yourself. On Pandora, you can also comment on friends’ stations, bringing the conversation to the music instead of pushing the music to Facebook the way you do when you post a link to a song you’re listening to. Some services like Mog and Spotify use your existing Facebook friends and the artists you follow to recommend music you may like. Mog includes an “Inspired by your friends” section that features music from artists that your friends have liked on Facebook. Last.fm Last.fm bills itself as a music recommendation service, but it also features a robust community. You can post comments about a song, album, or artist on pages for each, or use the forum to chat about music in general with the Last.fm community. Looking for some new music friends? The service includes a musical-compatibility rating for any user, showing how similar your tastes are. Turntable.fm For a more interactive experience, try turntable.fm. This service features user-created “rooms” where you (in the form of an avatar) can listen to—and play—music that fits the room description. Americana fans could try the “Folk/Americana/Blues/Soul - It’s All Connected” room. Want to hang out with coders? Join the “Coding Soundtrack” room and hear what other coders like to listen to while on the job. These niche groups are a great way to find new music, and each has a chat feature so you can discuss the music with other members who are in the room at the same time as you are. With so many ways to make music a social experience, the only limiting factor is you. Anyone who thinks there’s nothing new to listen to is just being—musically speaking—antisocial.